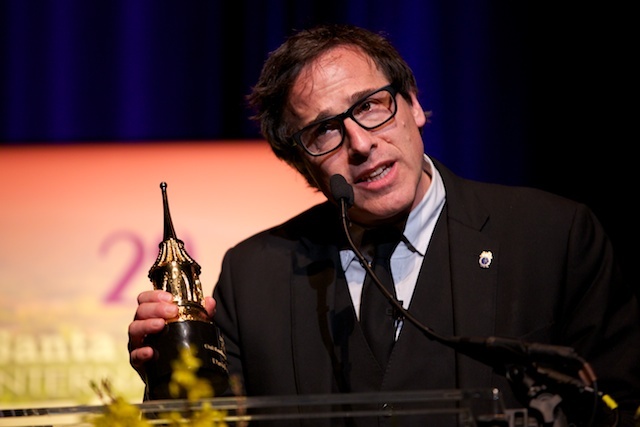 Long time Roger-watchers know that there has been an evolving relationship between the SBIFF chief and director David O. Russell, beginning with a disastrous flop of a sweaty interview conducted during the period just after Russell’s I Heart Huckabees hit theaters. Despite initial awkwardness, a mutual admiration society grew progressively more genial over the years, and by now the pair seem to possess a stand-up-like partnership. They jibed (and jived) each other on Friday night during the first award presentation of the 29th annual fest, in which Russell was awarded outstanding director honors for his brilliant 1970s Abscam melodramatic farce, American Hustle. For the most part, Russell controlled the interview, Durling playing along in a comically frustrated vein as much-beleaguered host. There were jokes about who was interviewing who, and who had interrupted what, and jabs in the ribs. At one point Durling told Russell he wouldn’t get buzzed from the water in their onstage goblets, and Russell wondered if Durling’s smooth charms had inspired babies to be brought forth onto the planet. This was followed by Durling’s best attempt at Jack Benny mugging the audience. Hard questions were not addressed by the guest. When Durling tried to get Russell to elaborate on his well-chronicled problems raising a bipolar son, the director turned to the crowd and said, “Thanks everybody for coming out tonight, and hope to see you at the party.” Durling did get him to admit his consciousness had become more interested in human warmth, and the director agreed he was now more prone to seek the delights that too-short life offers.